my leg/ankle is not broken, and in this wonderful country (aka South Korea), i saw an orthopedic surgeon and got x-rays for 10USD. if the meds don't help, i'll have to have a $10 MRI on Tuesday. no insurance necessary. The rainy season (Jangma) seems to have commenced early this year, but it is welcome because summer came fast and hard, too. The sky was light at 5am, and as I sat trying to coax myself to sleep, shadows blotted out the apathetic sun. To my bleary eyes the change was sudden, and I moved to the window to witness the last of the light disappear. In the early morning hours Gwangju begins its hustle, so if sleep has not come by five, i'm usually left without. In the light, the drunks are returning home with loud choruses of "Tae Han Min Guk" (damn the world cup), couples on every side begin their morning quarrels, babies sputter, old men hack and talk loudly on the streets and in stairwells, and I sit enveloped in their waking life. But today, with the clouds, everything changes. Nagan Eupseong’s (낙안읍성) location leaves little wonder as to why Korea was so difficult to unify. 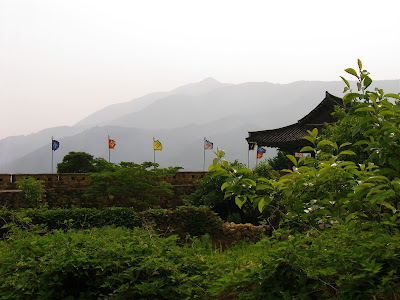 Situated in a low valley, Nagan Eupseong’s initial fortifications are the mountains that surround it. Steep, rock-faced and densely forested cones rise on all sides, and even in these modern times, the well-paved roads feel treacherous. Sharp turns and blind corners twist up and down the mountains’ sides, cleared only as far as the road needs to be wide, so upon entering the valley the expanse is awe-inspiring. The valley’s floor is a patchwork of rice paddies, barley fields and hay that stretch from mountain to mountain. Farmers dot the landscape irrigating or walking on the narrow, earthen ridges between fields. The long road is straight, dividing the valley almost in half, until it turns into a small smash of restaurants, markets and specialty shops. You know, the place where tourists go.